According to Nielsen, 40% of Americans use a smartphone or tablet at least once daily when they watch TV, while 85% say they do it at least once a month. They’re doing things such as shopping, using e-mail and social media as well as checking sports scores. But over the last couple of years a slew of interesting apps are letting them do even more. Called second screen or companion apps, they can do things such as listen to your TV to figure out what you’re watching to provide you with related content. They also let you chat with others who are watching the same thing, or let you stamp screenshots of shows with witty quips and share them with friends. If you’re wondering why you would want to do these things while watching TV, you should check out the second screen apps below. You may be surprised how much fun your entertainment can be with a little more interactivity. More than 3 million people use this Foursquare-like social network for entertainment. It lets you check-in to TV shows and movies you’re watching, see what friends are watching, chat with other people watching your shows, unlock stickers and discounts as well as share your comments and check-ins on Facebook, Twitter, Tumblr and Foursquare. Not only does GetGlue have official rewards for hundreds of shows, including coupons, free items and chances to win drawings, the more you use it the better it gets at giving you recommendations for things it thinks you’ll like, such as shows, movies, books and music. You can even “like” everyday things such as lunch or work and chat with other people who also are interested in those topics at the time. GetGlue is free on the Web, Google Play and the iTunes Store. This app, used by more than 275 million people worldwide, truly gets you interacting with your TV. For one thing, it can listen to your television and figure out what you’re watching (asking it to do so is “tagging” a show). Within seconds it updates your device with the latest information on the program such as a description of the show, links to buy soundtracks on Amazon, information about the cast as well as links to sites like IMBD and Wikipedia where you can get even more information. It works great for music playing on the radio, too. If you hear a song you love, pull up Shazam on your mobile device and tap the main screen to have it listen. Shazam will give you the name of the track and artist, streaming lyrics, videos, special offers and other content. 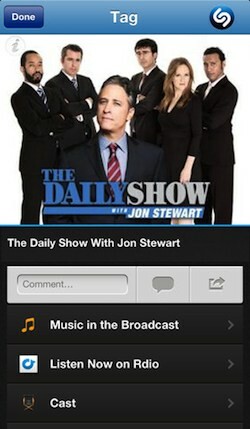 Shazam is more than just a nifty tool, however, because it’s highly social. You can share your tags on a wide variety of social networks—in fact, all of your Shazam activity is shared on Facebook if you authorize it to do so when you sign in the first time. Then when your friends click on your tags, they also get a wealth of data about what you’re listening to. This also works in reverse. Shazam can show you songs or shows your friends have tagged, as well as a chart of the most popular content on the social network. You can even use it to tag TV commercials and get special offers from the adverisers. This works best during big broadcast events such as during the Olympics or the Super Bowl. Shazam is free on all major platforms. 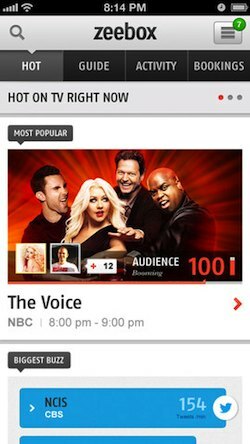 IntoNow is another social TV identification app but it swaps out some features Shazam offers, such as ad identification, with ones that might get more traction. For instance, not only can it identify General Hospital or Dancing With the Stars, it will give you real-time screenshots from the show on which you can “capit,” meaning you can add bolded comments to it that your friends or others on the social network can see, which is a fun way to get people discussing the merits or demerits of a show and its characters. 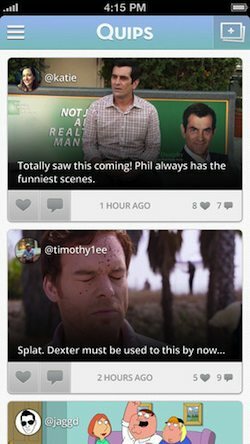 It also includes trivia, discussions, polls, live sports information as well as a news feed that shows you when your friends are talking about a show or playing with trivia. IntoNow is free in the iTunes Store and at Google Play. This one provides a feature similar to IntoNow’s capit, in that you can find a scene from a show you’re watching, caption it and push it out to Facebook and Twitter. Again, it’s a fun way to get conversations started around your favorite programs, as well as see what others are saying about them. 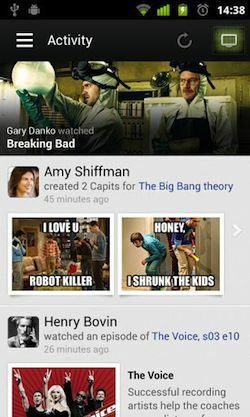 It also keeps you in the know about what shows your friends are talking about and lets you like and comment on their posts. Can’t remember which night Person of Interest is on? Quips will also send you weekly reminders regarding new episodes of the shows you like to watch. Quips is free in the iTunes Store. This one has been downloaded more than 1 million times in the last three month. It offers an interactive TV guide that you can sort according to what kind of buzz a show is getting on Twitter and how engaged audiences are with it. It can also display shows by channel or which friends are watching what. Another nice feature is called Bookings, which tells your friends what you plan to watch later and gives you a reminder right before the show starts. The guide is unique in that not only can you provide show and cast information, it gives you news about the show, links to show-related apps and websites as well as “zeetags” for various actors or subjects discussed on a show that dive deeper, providing even more related tweets and apps. All these features allow you to get as deep into discussing and exploring your favorite show as you want to go. If you prefer to use your laptop as a second screen, Zeebox is also available as a clean-looking web app. 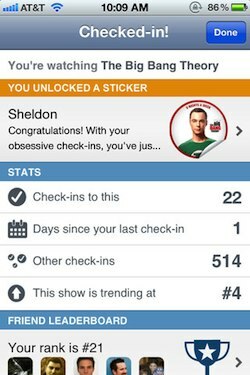 This year-old second screen app rewards its 1.8 million users for watching TV shows. The more you watch and the more you interact with others on the site, the more points you earn. And what can you get for your TV viewing? 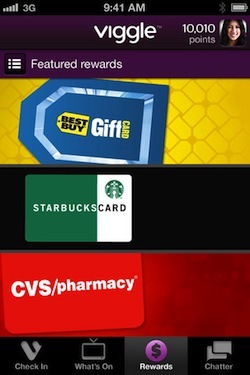 In the last year, Viggle has given away over 1.3 million individual rewards, including rewards from major retailers such as Amazon, The Gap, Best Buy and Sephora. More specifically, "Viggle has conducted 28 sweepstakes, giving away 41 million Viggle points, a trip to Hollywood, a 3D HDTV package and an all expense paid trip to Sunday's big game in New Orleans,” the company said in a statement. As if that’s not enough to pique your interest, it also can recognize TV shows on more than 170 channels just by listening to them. Viggle is free in the iTunes Store and at Google Play. We hope one of these apps makes your TV viewing even more rewarding than before. Connecting with others who share a passion for your favorite program may be the biggest reward of all. If you have a favorite second screen app we didn't mention here, let us know in the comments below.